All signs point to the fact that this might be the year to try snowshoeing. Sub-zero, recording breaking temperatures have already been recorded across Michigan, even in the metro-Detroit area. Lake-effect snow is hammering the Lake Michigan region and in the Upper Peninsula, well, it’s the Upper Peninsula. They’ve probably been snowshoeing since September. But the best sign in our household is that Santa left a pair under the Christmas tree – no matter how creatively you wrap snowshoes in Jingle Bell paper, they still look like snowshoes – and somebody is eager to try them. You can purchase snowshoes at outdoor shops across the state (check our list of retailers), you can rent them at most downhill ski areas. But where do you go for go for your first time and be guaranteed you’ll want to slap on rub-beaters again this winter? Summit-to-Stein’s Snowshoe Suppers; Friday and Saturday through March 10: Boyne Mountain stages this unusual gastronomic evening that begins with a ride up the mountain and ends at the bottom with a three-course fondue dinner at Stein Eriksen’s Restaurant. In between, the guided trek stops at Eagle’s Nest for spiced wine and hot cocoa while participants are being fitted for snowshoes and then descends the mountain where halfway down there is a bonfire with hot toddies. The event is $59 per person and includes chairlift ride, beverages at Eagle’s Nest and the bonfire, snowshoe rental and three-course dinner. Contact Boyne Mountain (231-549-6854) for reservations. The 45 North Vineyard Trail; This vineyard on the Leelanau Peninsula grooms a 3.2-mile loop through its scenic vineyard that you can explore on skis or snowshoes. The trail is free to use Monday through Sunday from noon to 5:00 pm and features terrain from gentle slopes to uphill climbs. The trail starts near the tasting room and wanders through the lower vineyard before starting uphill where you top out to views of the surrounding rolling hills. It then winds downward through a wooded portion before returning back to the tasting room. Contact 45 North Vineyard for more information. 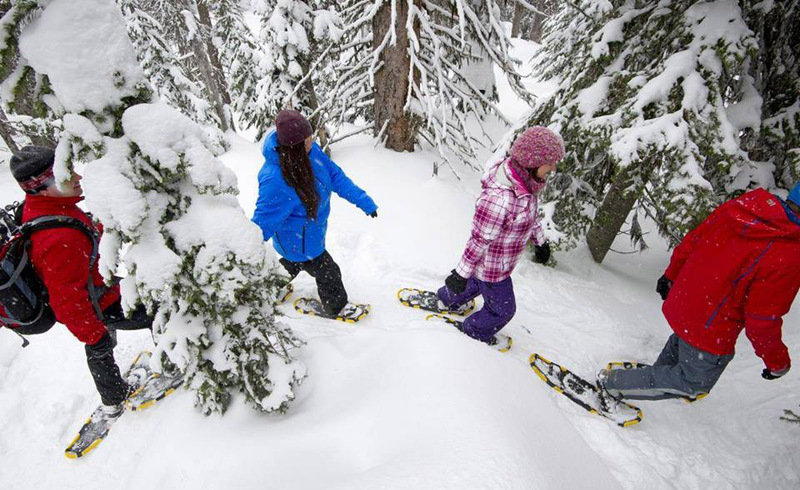 Snowshoe Demo Day; Jan. 13: Latitude 45 Bicycles and Fitness of Petoskey, Little Traverse Conservancy (LTC) and Top of Michigan Trails Council are staging snowshoe and fat bike demos at the Offield Family Nature Preserve on Quick Road in Harbor Springs on Saturday, Jan. 13, from 1- 3 pm. LTC has been grooming the trails this winter and Latitude 45’s will have demo snowshoes and fat bikes available for free use. Reservations for gear are appreciated and can be obtained by emailing Latitude 45 at latitude45bicycles@gmail.com. Snowshoe Vines & Wines; Jan. 14; Blackstar Farms at Suttons Bay offers trails through the vineyards for snowshoers Saturdays and Sundays throughout the winter from noon to 4 p.m. Rental shoes are available and afterwards enjoy wine, chili or hot chocolate on a heated terrace. Treetops Culinary Adventure Series; most Saturdays through March 3: Along with 7 kilometers of designated snowshoe trails and rentals, this Gaylord Resorts offers snowshoers access to its remote Project Nature property for a gourmet winter adventure. Participants trek at their own pace while stopping along the way at five gourmet food and beverage stations. The four to five-hour event begins at 10 a.m. For reservations contact Treetops (866-348-5249). Sleeping Bear Dunes Sunday Snowshoe Hikes; Jan. 14: New this year rangers will be leading Sunday snowshoe treks throughout Sleeping Bear Dunes National Lakeshore on Sundays as well as Saturday beginning from Jan. 14 with participants meeting at the Philip A. Hart Visitor Center in Empire at 1 p.m. Free loaner snowshoes will be available but reservations are required whether participants borrow snowshoes or not. Call 231-326-4700, extension 5010, to make reservations. Old Mission Snowshoe Wine & Brew; Jan 14; On Sundays through March 4 you can leave your car at Jolly Pumpkin in Bowers Harbor and hitch a ride on TC Brew Bus to the start of a snowshoe adventure. The 1.5-mile groomed trail ends back at the Jolly Pumpkin Restaurant after passing two other vineyards along the way. The $20 event includes wine tasting and a ride on the TC Brew Bus. Lantern-lit Snowshoe Event; Jan. 20: Ludington State Park in Mason County will stage snowshoe and ski events along lantern-lit trails from 6-8 p.m. on select Saturdays throughout the winter. Dates are Jan. 20 and Feb. 3 and Feb. 17. The lighted trail begins at the park’s warming shelter, located next to the parking lot at the end of State Highway M-116. and travels through the park’s snow-covered, forested sand dunes. The park has more than 40 pairs of snowshoes to loan out on a first-come, first-served basis. Visitors are also welcome to bring their own cross-country skis or snowshoes. For a complete list of snowshoe and other winter events at state parks go to michigan.gov/winterfun. Sleeping Bear Dunes Saturday Snowshoe Hikes; Jan. 20: Rangers will be leading guided snowshoe treks throughout Sleeping Bear Dunes National Lakeshore on Saturdays from Jan. 6 through March 17 with participants meeting at the Philip A. Hart Visitor Center in Empire at 1 p.m. Free loaner snowshoes will be available but reservations are required whether participants borrow snowshoes or not. Call 231-326-4700, extension 5010, to make reservations. The snowshoe treks will last two hours and a park entrance pass or an annual pass is required. Guided Snowshoe Nature Walk; Jan. 20: Ludington State Park in Mason County will stage a mid-afternoon guided snowshoe walk from 2-3:30 p.m. that will highlight the park’s nature and history while traveling through stunning snow-covered sand dunes. The walk begins at the warming shelter, located next to the parking lot at the end of State Highway M-116. Walks also slated for Jan. 27, Feb. 3, Feb. 10 and Feb. 17. The park has more than 40 pairs of snowshoes to loan out on a first-come, first-served basis. Visitors are also welcome to bring their own cross-country skis or snowshoes. For more information go to: michigan.gov/winterfun. Snowshoe in the Park; Feb. 10: A trek will be staged through Leelanau State Park and around the Grand Traverse Lighthouse on Saturday, Feb. 10 and March 10 from 10-11 a.m. There will be 18 pairs snowshoes for children and adults to borrow. Meet at the Lighthouse gift shop which will be open after the hike for a short time. Tahquamenon Falls Lantern-lit Snowshoe Trail; Feb. 3, 10, 17 & 24: Tahquamenon Falls State Park, Michigan’s second largest, sets up to a mile long lantern-lit trail at the Upper Falls that is illuminated with more than 70 kerosene lanterns. The trail begins and ends near the Upper Falls restroom building and there will be loaner snowshoes available for those without rub beaters. Lantern-lit Snowshoe Event; Feb. 16 & 23: Another in the series of lantern-lit snowshoe treks will be held at Waterloo Recreation Area on Saturday, Feb. 16 and 23 from 7-9 p.m. A half-mile loop will be lit for cross-country skiers and another half-mile loop for and snowshoeing with a campfire to warm up in between laps. A few pairs of snowshoes will be available to borrow. Meet at Gerald Eddy Discovery Center, 17030 Bush Road in Chelsea. Full Moon Snowshoe Hike; March 2: Hartwick Pines State Park will stage a 2-mile guided hike through moon lit unbroken snow. A limited pairs of snowshoes are available to borrow. Shoe fitting will begin promptly at 7:30 p.m. on a first come, first served basis. The hike will depart at 8 p.m. from the Hartwick Pines Visitor Center (989-348-2537). Van Riper Lantern-Lit Snowshoe Trail; March 16: The final snowshoe event of the winter? Only in the U.P. in the middle of March could they stage this. Van Riper State Park will set up one last time a 1.25-mile trail lit by lanterns. The trail begins and ends at the Peshekee Cabin where there will be a roaring fire and complimentary cocoa, coffee and light snacks.